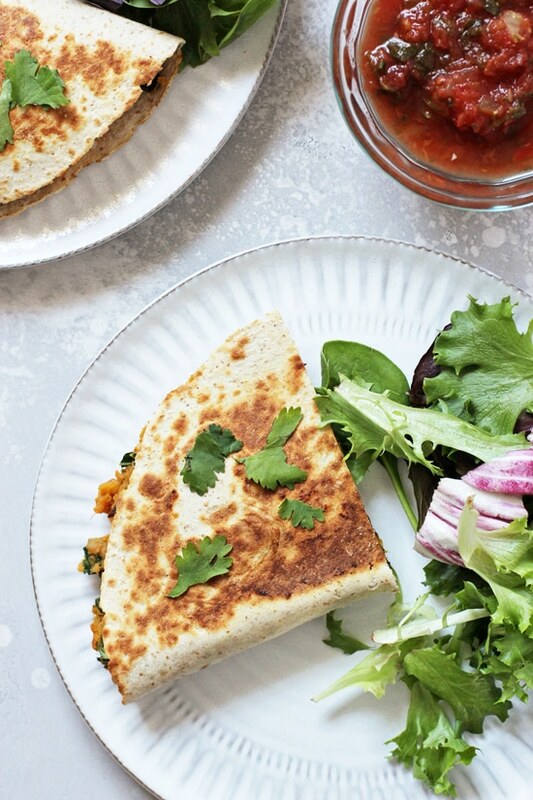 These sweet potato, black bean and kale quesadillas were originally published in March 2013. The post has been updated as of January 28, 2019 with new photos, text and improved recipe instructions! 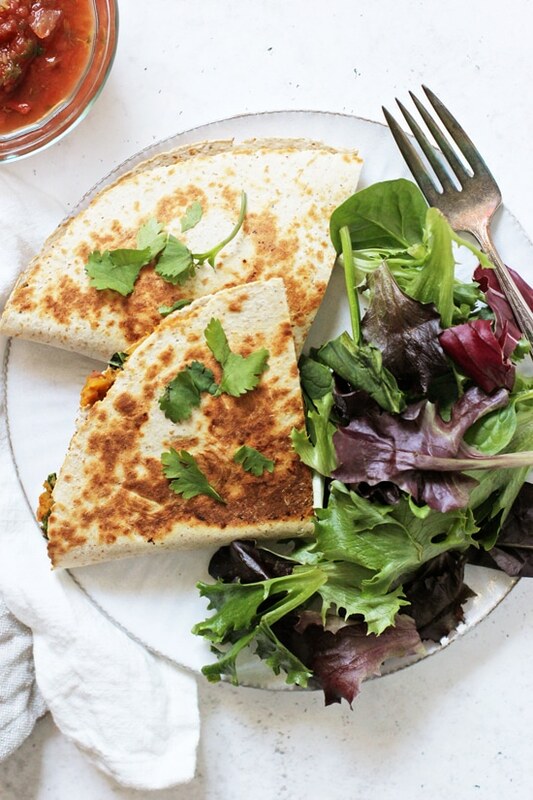 Today we talk an old favorite with these sweet potato black bean quesadillas! Which have long been one of the most popular recipes on this site (!!). And for good reason. They’re cheesy, crispy, slightly smoky, oh-so-flavorful! And make an excellent option for dinner OR for a game day feast. So clearly it was time for a bit of a revival in the form of new photos and some tips & tricks (& options!) to make the recipe even better. Now, for those of you who have been making these, do not worry. The recipe is still exactly the same. But! The instructions are a bit clearer AND I eliminated the need to dirty up a large bowl (instead we’re just mixing the filling all together in the pot we use to cook the potatoes). Because less dishes to wash is ALWAYS a good thing! Can I get a yes yes?! Now, on the flip side, for those of you who are new to this recipe, let’s discuss. We have a creamy mashed sweet potato filling that is packed with spices and smoky chipotle peppers (yesss). There’s some kale and green onion for freshness and some black beans for a bit of protein. It gets cooked up inside a tortilla until nice and crispy, and then we serve with lots of fun toppings. Maybe some salsa, avocado, hot sauce, chopped cilantro! You really can’t go wrong. It’s simple, healthy and perfect for meatless monday. So, let’s discuss the actual cooking process. First up, we make the filling. We boil sliced sweet potatoes until nice and tender, then mash and mix together with all the seasonings, kale, green onion and black beans. Next, we form our quesadillas. Some of the filling gets smeared on half of each tortilla and topped with cheese, before being cooked off to crispy, melty perfection. First up, let’s talk options. To make these quesadillas vegan / dairy free, use your favorite dairy free shredded cheese and be sure to serve with appropriate toppings. OR you can also just completely leave off the cheese (the sweet potato filling helps hold the quesadillas together). However, if you go this route, be sure that your filling has enough salt and flavor to your liking (as you’ll lose some of the salt and flavor from the cheese). And definitely serve with some toppings to boost the taste. Another option, you can use spinach instead of the kale (I would do three well packed cups) or even shredded chicken instead of the black beans (you’ll want about 1 ½ cups). Lots of choices here today! Moving along, you can absolutely peel your sweet potatoes if desired. I personally leave the skins on since it’s easier / quicker and there’s lots of great nutrients in the skin. Now, if you don’t like spice, use less chipotle peppers to taste. With the full two peppers, there’s definitely some kick, but not in a completely overwhelming kind of way. Your yield may vary slightly depending on how full you stuff your quesadillas and the exact size of your sweet potatoes. And finally, the cook time is based off 30 minutes to make the filling plus 20 minutes to cook the quesadillas in a large skillet. I can fit two assembled quesadillas at a time in my skillet – so your cook may vary depending on the size of yours. Option #1: Make the sweet potato filling in advance and store in an airtight container in the fridge. When ready to enjoy, reheat the filling slightly, then assemble the quesadillas and cook off in a skillet. 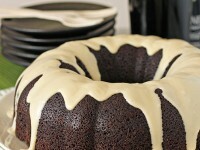 Option #2: Make the filling then let it cool to room temp. Assemble the quesadillas as directed, then wrap each individually in plastic wrap and transfer to the fridge (they’ll keep like this for about 1 to 2 days). Cook them off in the skillet when ready to eat. 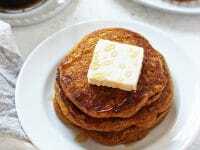 Additional Main Dish Sweet Potato Recipes You Might Enjoy! 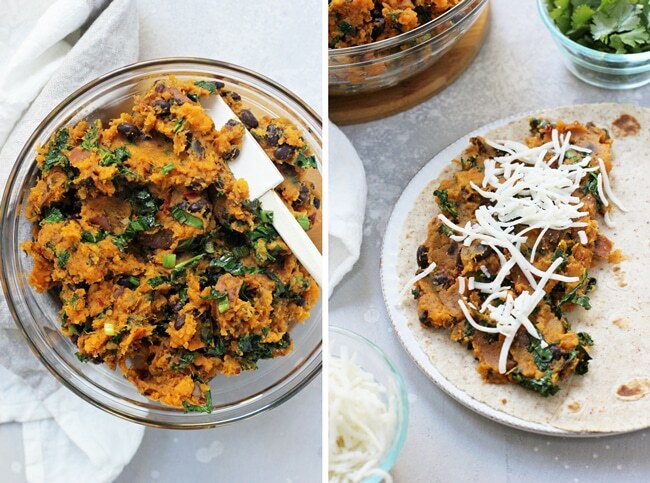 These sweet potato, black bean and kale quesadillas are a simple & healthy meal! With a creamy chipotle filling, crispy exterior and plenty of cheese! Excellent for dinner or game day! Add the sliced sweet potatoes and ½ teaspoon of the salt to a large stockpot. Add in enough water to cover the potatoes. Bring the water to a boil then reduce the heat to medium high or medium (whatever is needed) and simmer for about 15 minutes, or until the potatoes are tender and mash easily with a fork. Drain the potatoes and return to the pot. Use a potato masher to mash the potatoes, then add in the remaining ¼ teaspoon salt, the cumin, chili powder, oregano and chipotle peppers. Mix until well combined. While the potatoes are simmering, add the olive oil to a large nonstick skillet set over medium heat. When hot, add in the kale and green onions. Cook for about 3 minutes, until the kale is bright green and wilted slightly. Remove from the heat. Add the mixture, along with the black beans, to the pot with the mashed sweet potatoes. Mix to combine. Taste and season with additional salt and / or pepper as desired (I usually add more salt - somewhere around ½ to ¾ teaspoon). Place a tortilla on a work surface. Smear about ⅓ to ½ cup of the filling on half of the tortilla, leaving a small border around the edge. Top with about ¼ cup of the cheese (or to taste). Fold the empty half of the tortilla over the filling to form a semicircle. Repeat with the remaining tortillas. Wipe out the skillet you used for the kale and set it over medium heat. When hot, place 1 to 2 assembled quesadillas in the pan (depending on the size of your skillet and what will fit comfortably) and cook, flipping once halfway through, until both sides are browned and crispy and the cheese is melted. Repeat this process with the remaining quesadillas. Cut the quesadillas into triangles and serve as desired! See the tips & tricks section in the post above for dairy free / vegan options! Absolutely delicious!! It’s my second time making it and I love this recipe and my quesadillas. I made it for dinner and my brother who is not a fan of kale or whole wheat breads loved this! He even got seconds!! We also made a really yummy home made corn salsa to go with it! So good! Also, does anyone know what the nutrition facts are for this recipe or the calorie count? I am so happy to hear this Jasmine! Thanks so much for letting me know! Has anyone done a calorie count for this? I made this for dinner yesterday. 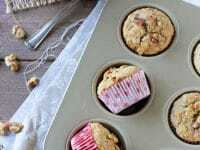 Thanks for sharing this recipe ! My husband loved it ! I had bought a sweet potato for like 2 weeks back and couldn’t think of anything interesting to make with it. 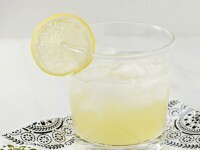 This recipe is a super hit !! Nice to make for dinner. I served with salsa, guacamole and sauteed kale salad. I’m so happy to hear you both enjoyed it!! Thanks so much for letting me know! I don’t normally comment… But this is one of my go-to recipes we’ve had in rotation for over a year now. It’s delicious and easy- a quick meal that’s actually pretty packed with greens goodness and tons of flavour. Thank you for sharing! Oh I’m so happy to hear this! Thanks so much for letting me know Lauren! These look delicious. Packed with healthy goodness. Can’t wait to try! This is the perfect recipe for tonight! I knew I wanted to make some version of sweet potato and black bean quesadillas so this is the perfect way to jazz them up! Can’t wait to try it! Thanks Sonal! Hope you enjoy!! I made these last night and my partner and I loved them! I used vegan cheese and baked them instead of panfrying. I served them with hot sauce, gaucamole, and fresh salsa, and it was such a delicious dinner. They are very filling too, which meant there were leftover for lunch today! Thanks for a great recipe. I’m so happy to hear this! Now you have me wanting some guac! These are delicious! I was looking for a way to use up some of the kale from our garden. We have more than we know what to do with! I’m glad I found this recipe! We can’t wait to use some of the leftovers tomorrow morning for breakfast burritos with scrambled eggs! Fabulous! Just made these tonight and they were wonderful! Thanks so much for letting me know Danica! I’m so happy to hear that you enjoyed them! Have you ever just baked the sweet potatoes and then mashed them? I haven’t for this recipe, but that should also work just fine! You just want them soft enough to mash easily. Would these come together without the black beans? It’s not that I’m Paleo or anything, I’m simply not a legume fan. Hi Van – yes, they should definitely work without the black beans! The beans do bulk it up a little so if you want to replace them maybe try some shredded chicken, etc. in place. Just made these for lunch. Super fast, filling and delicious. We served ours with sour cream and a ton of sriracha. Thanks for a great Sunday lunch! These look amazing! Any idea if they would freeze well, either just the filling or pre-assembled? I’d love to double/triple the batch and have some easy weeknight dinners on hand for both us and my little guy. I made these and they were delicious! My whole family loved them. I added some avocados on top which added a pop of color and tasted amazing. Great recipe! So so glad you enjoyed them! I absolutely love the addition of avocado – definitely will be trying that next time we have these! I’m going to try these! I want to use some purple sweet potatoes. Love them! Enjoy! Hope that you like them! has anyone tried boneless skinless chicken with this recipe? I was wondering how it would be with chicken. Please let me know. I added feta instead and it was amazing. Thanks for sharing! Oooh I bet the feta was great in these! I’ll have to try that next time! Thanks for sharing this phenomenal recipe. My family just snapped these up, they were incredible! I substituted spinach because we didn’t have any kale and I feel like we didn’t even need the cheese. Definitely a keeper! These are delicious! We dipped ours in mole sauce. Yum! Oooo great idea! So glad you liked them! I am making these right now. I added a little minced garlic to the pan when I sautéed the kale and green onion. The sweet potatoes and black beans got puréed together in the food processor, and the kale mixture got pulsed in as well. The flavor is amazing. I’m in love. Can’t wait to see how they turn out in the quesadilla form! So happy to hear this! Adding the garlic is a great idea – hope they turned out great! The flavor combination sounds wonderful! My vegetarian daughter is going to love this! Thanks. We tried these last night and loved them! Another brilliant use of kale that I can sneak past my picky husband. Thanks Ashley! Oh my gosh, I have a recipe just like this too! Although I skipped the cheese in mine. 🙂 Sweet potatoes and kale make such a great combination–they just make everything seem so much healthier. These look awesome! Love this combination for quesadillas! Quesadillas are a favorite around here, we’ll be trying them soon! Sweet potato, kale, and black beans is one of my favorite combos! I love the idea of putting it into a quesadilla! Thanks for sharing! Your quesadillas look just perfect, mine never look that good! Love it! Thank you! It took me a long time to get down how to flip any quesadilla without losing all the filling! 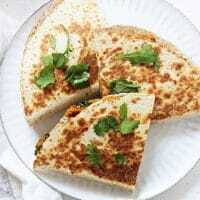 Love quick quesadillas for weeknight dinner, and the combo in these is fantastic! 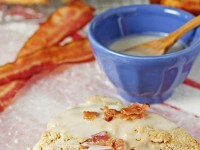 Just saw these on FoodGawker and then realized it was you! 🙂 These look so good, I am pinning them! Wow, these look so good! I’ve made a sweet potato black bean chili before and loved it, so I know I’ll love these. I’m crazy for kale, too! Oooo black bean sweet potato chili sounds fantastic! DUDE these are filled with everything that I love!! How did you know?!? And kale makes them healthy, right? 😉 Def. saving this one for a Friday night dinner! ok, I am OBSESSED with the fillings of these quesadillas Ashley! Everything I love. I just made a sweet potato and black bean chili and am yearning for those flavors all over again. These are a must try. we love making quesadillas! 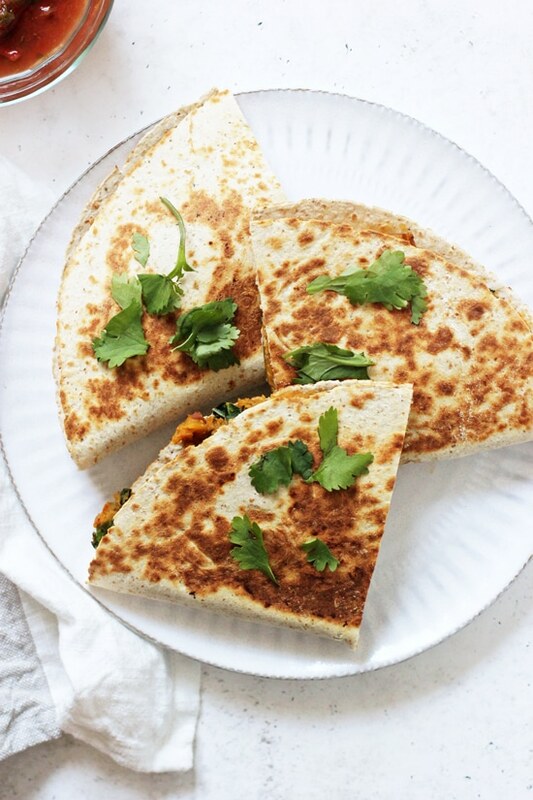 We love making quesadillas too – they are such an easy meal! Wow – these sound amazing. Non-traditional quesadillas have been popping up all over the blogosphere, but I think these are up in my favorite! Definitely need to try them. Pinned! Thanks Rachel! I know – there are so many I want to try!